It's a useful aide memoire: ''Box should be pruned by Derby Day'', along the lines of "Put slug pellets round your hostas on Valentine's Day"! Here are the before and after images, after using a small electric hedge trimmer. I also have a rechargeable cordless type, which saves me cutting through the cord yet again. Although I like the fresh green 'fuzzy' look of the new growth, it does look neater when pruned. Clear up the prunings to prevent the spread of fungal disease, and feed and water afterwards to help the plant recover. 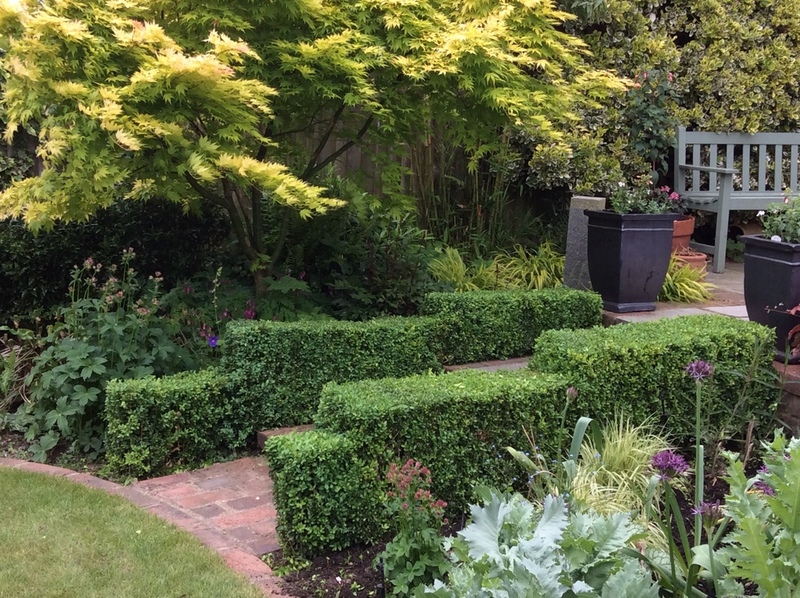 Somehow a formally clipped box hedge allows the rest of the planting to look relaxed within it, and gives the garden a cared-for appearance. The RHS has a lot of useful information about Buxus, see the link below.